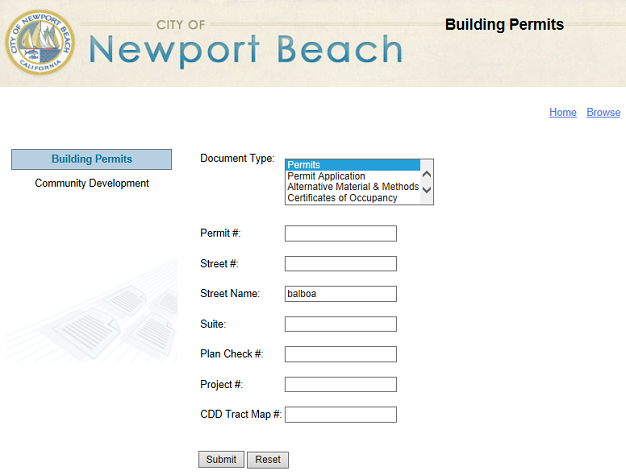 The community development department (CDD) at the City of Newport Beach, CA, processes a large number of building permits—13,849 in 2013 alone. Here is how the city automated this time-consuming process with Laserfiche Quick Fields, Laserfiche Workflow and Laserfiche WebLink. After the property inspection, the inspector would sign the back of the permit and bring it, along with all backup documents, to the records specialist. To keep track of the permits received from the inspector, the records specialist would compile a list of all permits and backup documents in a spreadsheet. The records specialist would send all of the paperwork to an outside scanning bureau. The scanning bureau would send a CD with the scanned documents back to the records specialist, who verified that everything he sent out (including all supporting documents) had been scanned by cross-checking the CD against the spreadsheet. Finally, the records specialist would import those files into the city’s legacy document management system, Alchemy, and enter metadata. Automating the permitting process with Laserfiche has reduced the processing time for one permit to less than a minute. Each permit now has a barcode appended to the first page. This barcode contains the permit number from the permitting system. 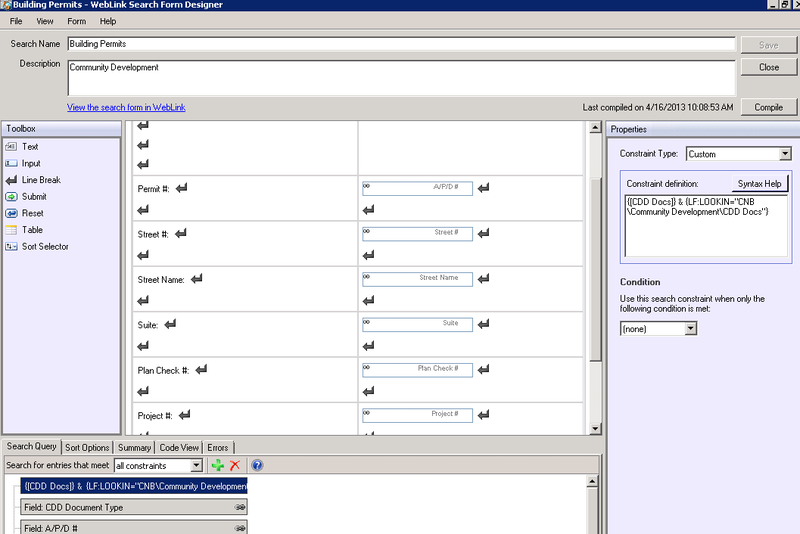 It also serves as a way to tell one permit apart from the next one when being processed with Laserfiche Quick Fields. With the new process, the inspector performs the inspection and signs the back of the final permit. The records specialist creates a stack of permits and supporting documents (with all supporting documents stacked directly under the permit with which they are associated) and scans it to a special folder on the network. Extracting the permit number from the barcode. Splitting the large file into smaller ones for separate permits by barcode and stores the documents in Laserfiche. Queries the permitting system based on the permit number to obtain identifying information, such as the property address. 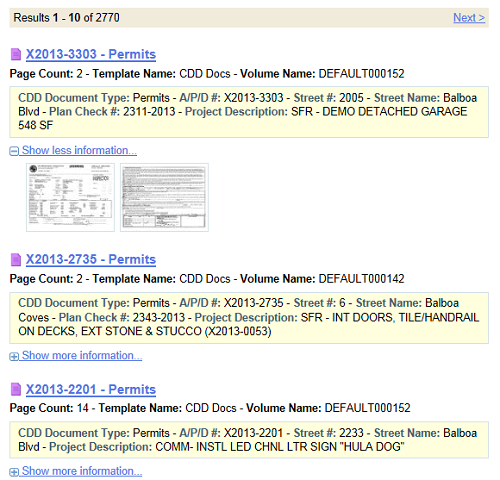 Uses the queried information to populate the permit document’s metadata. 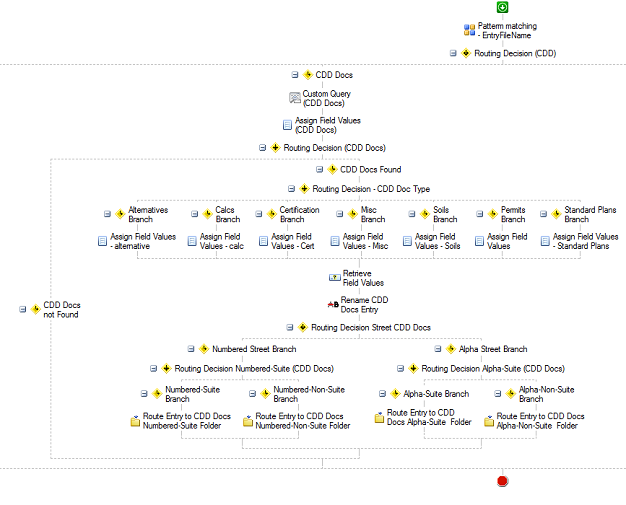 Routes the document to the appropriate folder for storage (based on the street name). Once the permits have been processed by Laserfiche Workflow and routed to their appropriate folder for storage, they are available for the public to view through Laserfiche WebLink. Laserfiche WebLink is embedded in the city’s website. The public can find permits either by browsing through the permit folders or searching by document type, permit number, address, etc. The city saves $6,500 a year by scanning documents in-house. 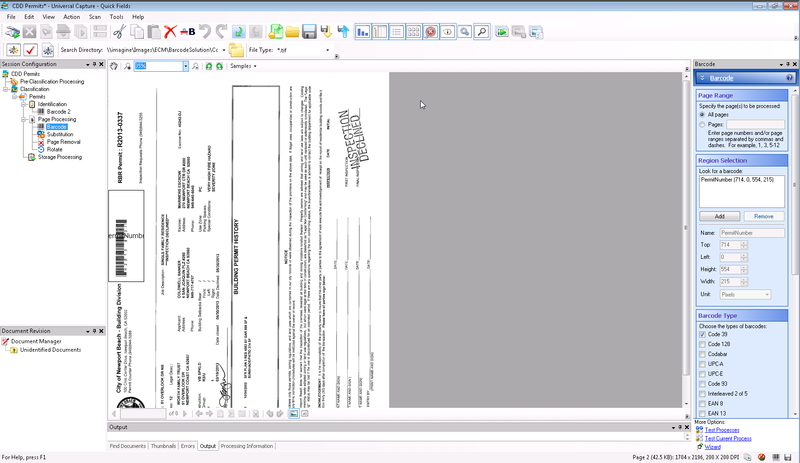 Processing all permit documents with Laserfiche Quick Fields eliminates metadata entry errors. It takes less than a minute from receipt of permit to the time that it is available for the public on the website. Employees and departments can easily share documents.